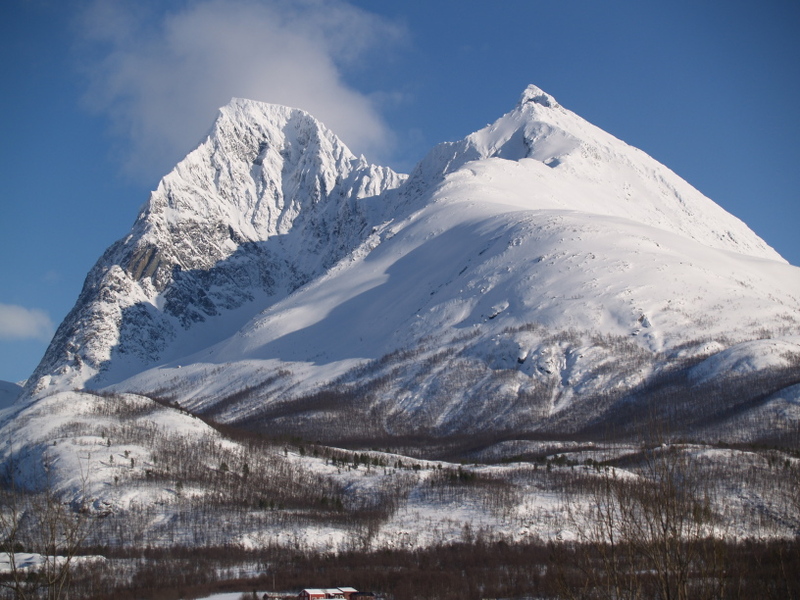 Guhkesgáisi´s West summit as seen from Lakselvdalen. 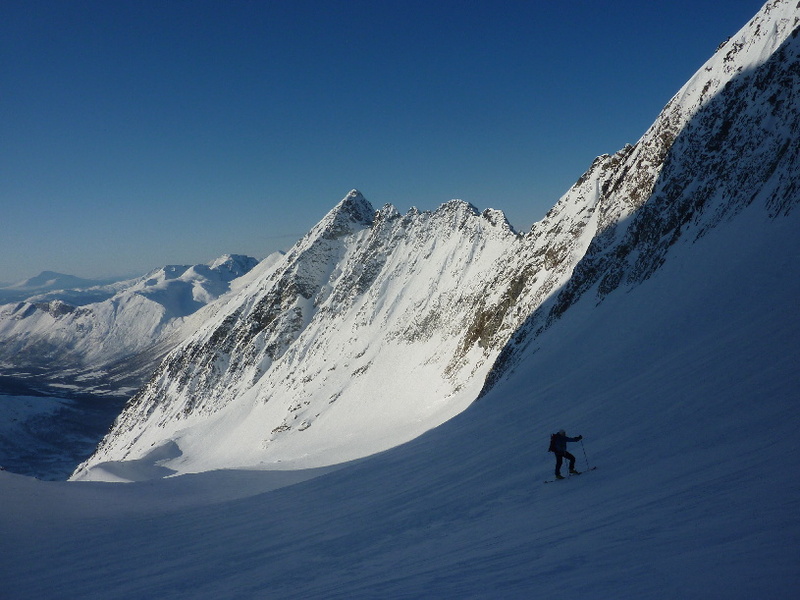 A brief description of the North face route on the West summit: start from the gravel pit near Slettmo in Lakselvdalen. Follow the dirt road on the South side of Ellendalen. 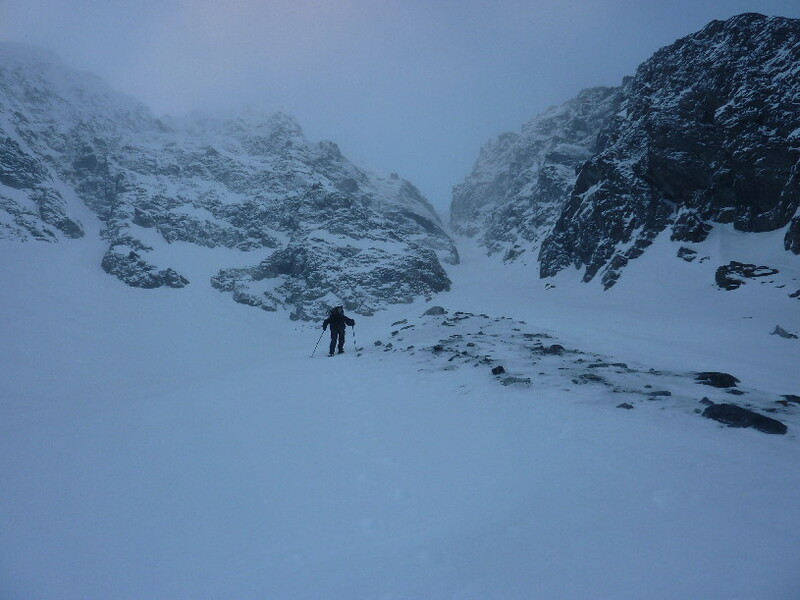 Turn southwards near the treeline and climb up to Ellendalsvatnet (500 m). 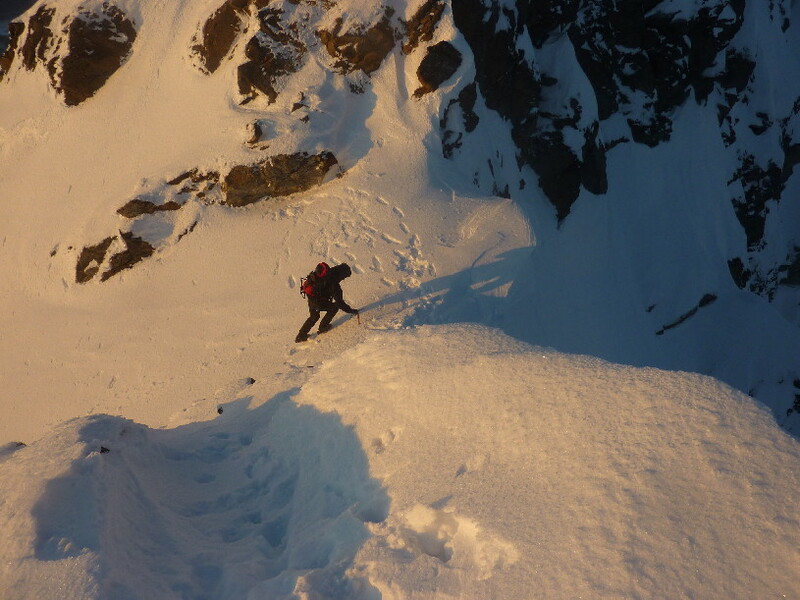 You should carefully consider the snow conditions before continuing above the lake. 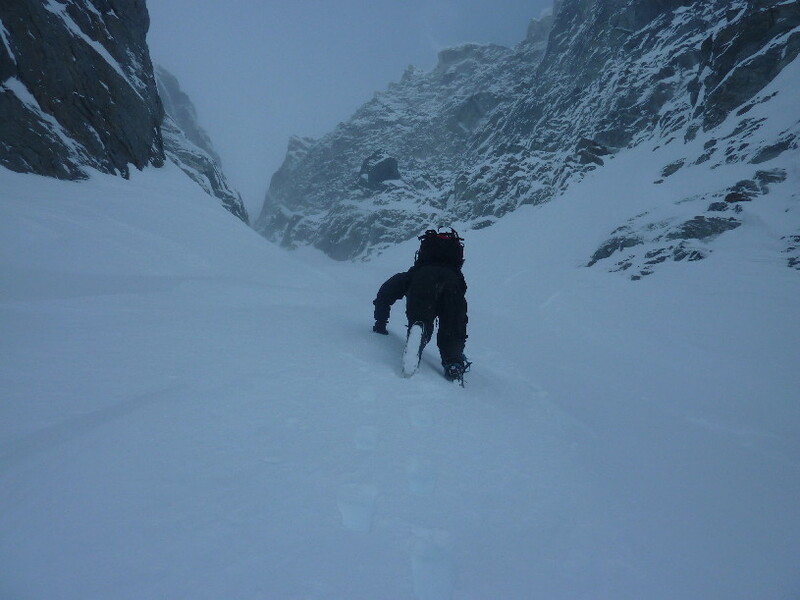 Climb the slope south of the lake up to 700 m and you will see the prominent couloir (45-50°) that leads to a notch in the West ridge (1200 m). From the notch the route traverses the upper part of the West face towards the South ridge and the summit. 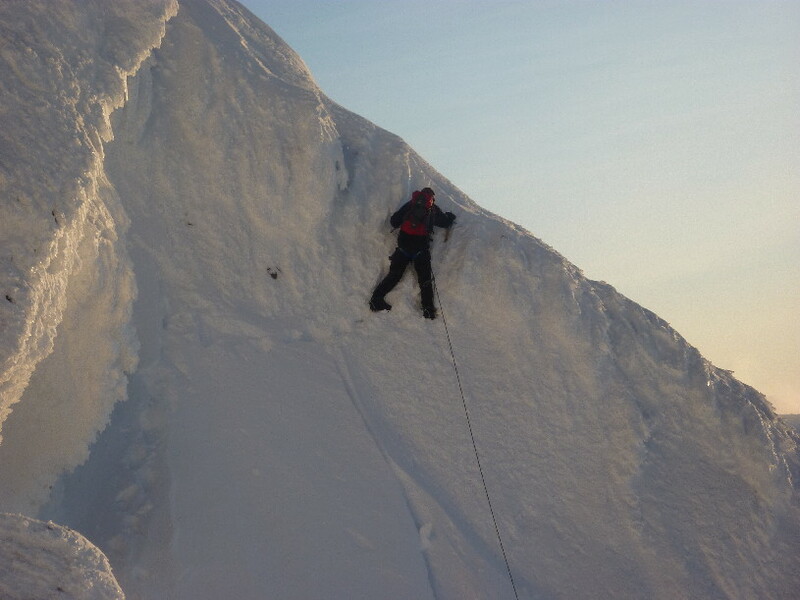 Climbed by Kent-Hugo Norheim and Geir Jenssen, 3. February 2010. The West summit as seen from the cirque to the East of the peak. 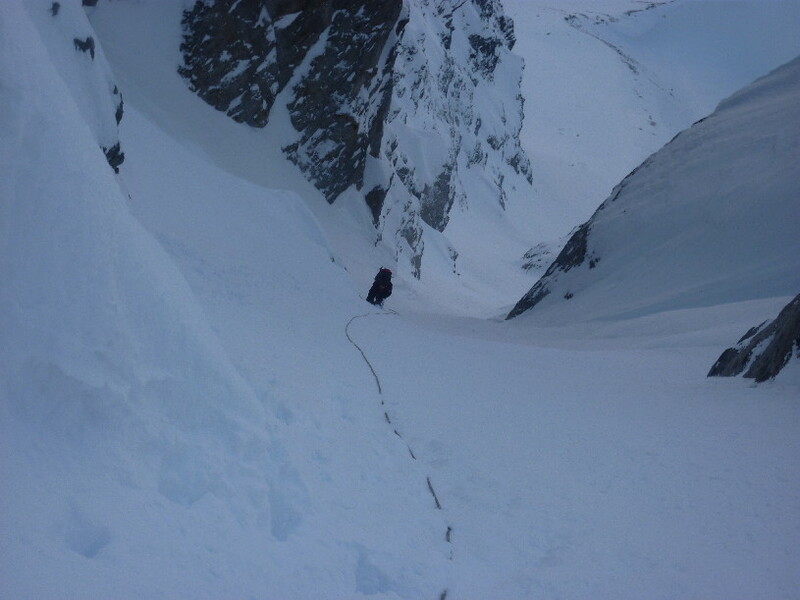 The route climbs the upper part of the South ridge (left hand skyline). 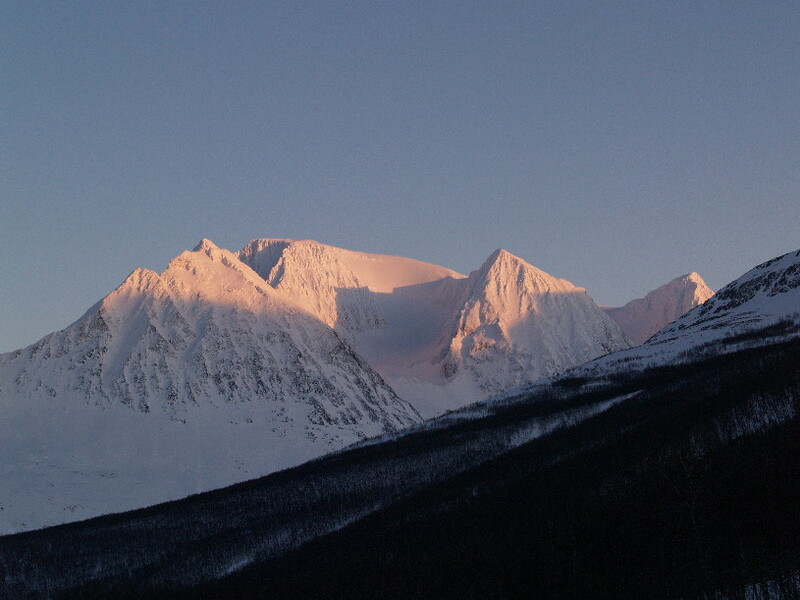 The West summit as seen from Lakselvdalen with the South west face facing the camera. 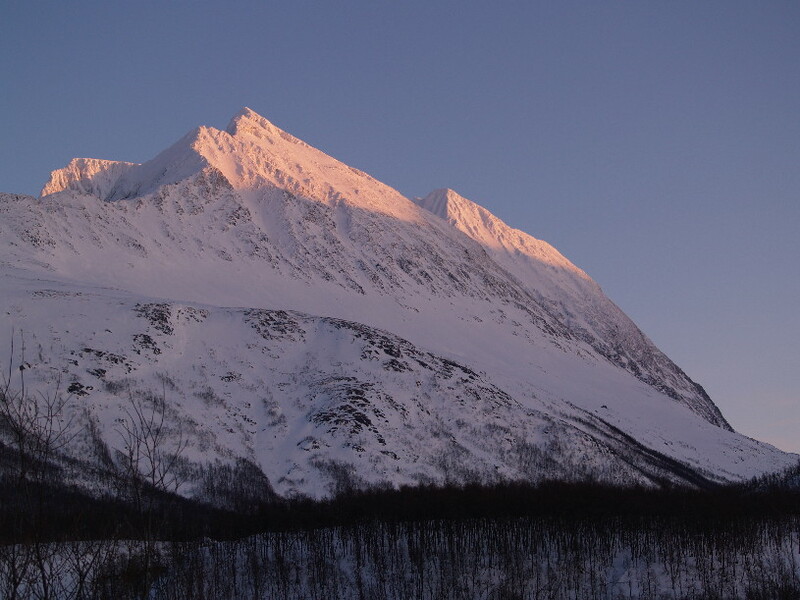 Guhkesgáisi as seen from Lakselvdalen with the West summit (1302) to the left. 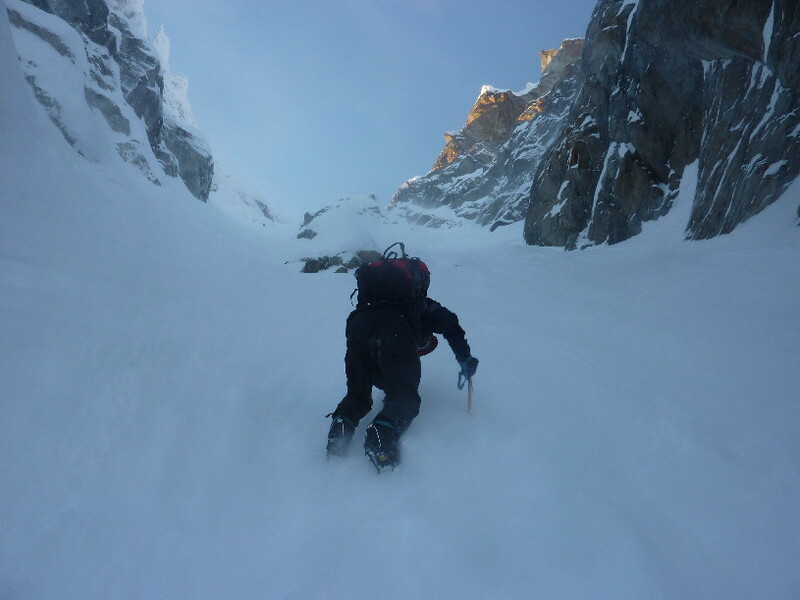 The North face couloir (45-50°) that leads to a notch in the West ridge. 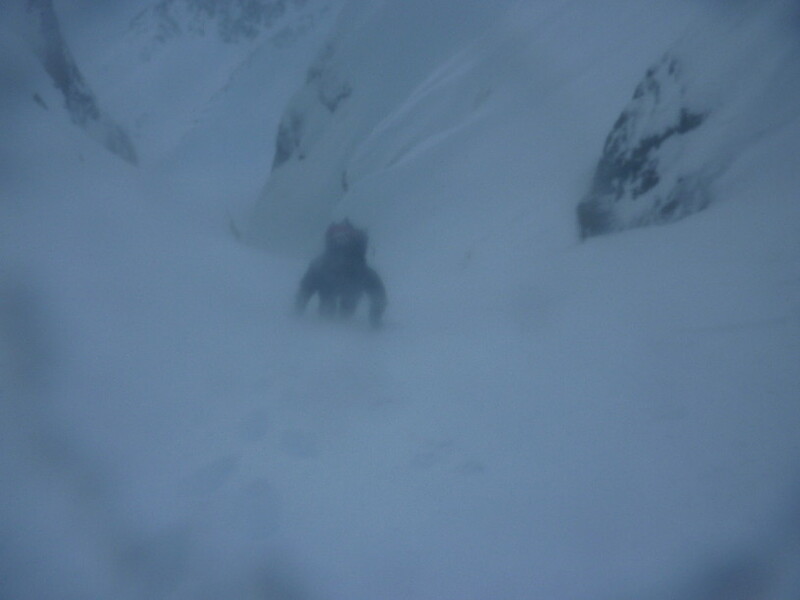 The spindrift disappeared as soon as we reached the West ridge. 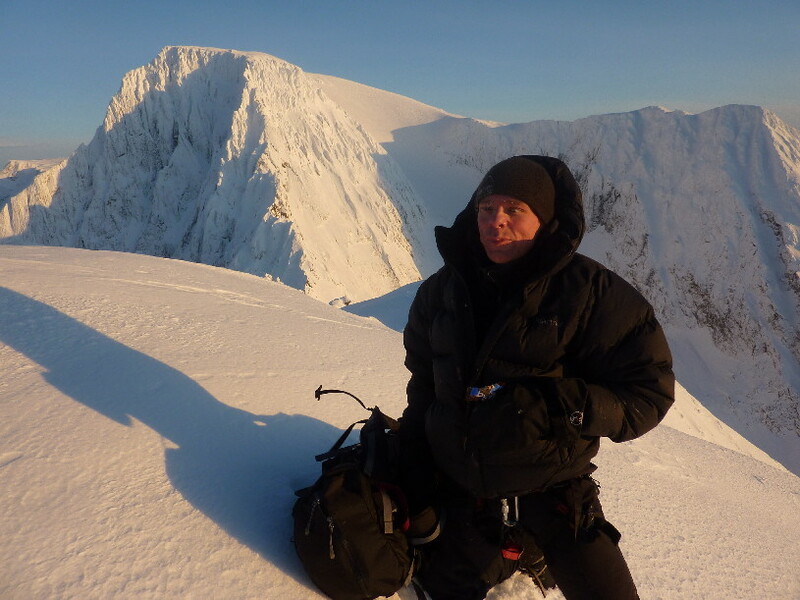 Kent-Hugo Norheim on the summit. 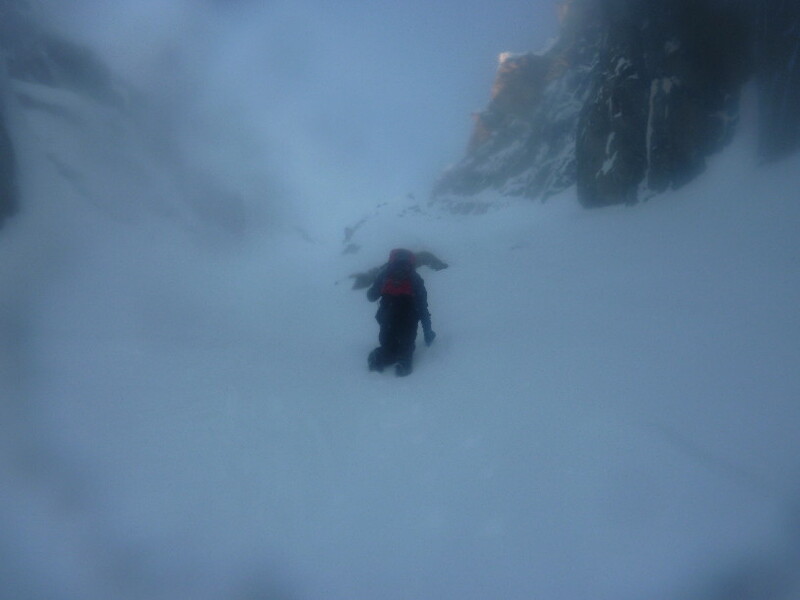 Returning to the notch and the North face couloir. 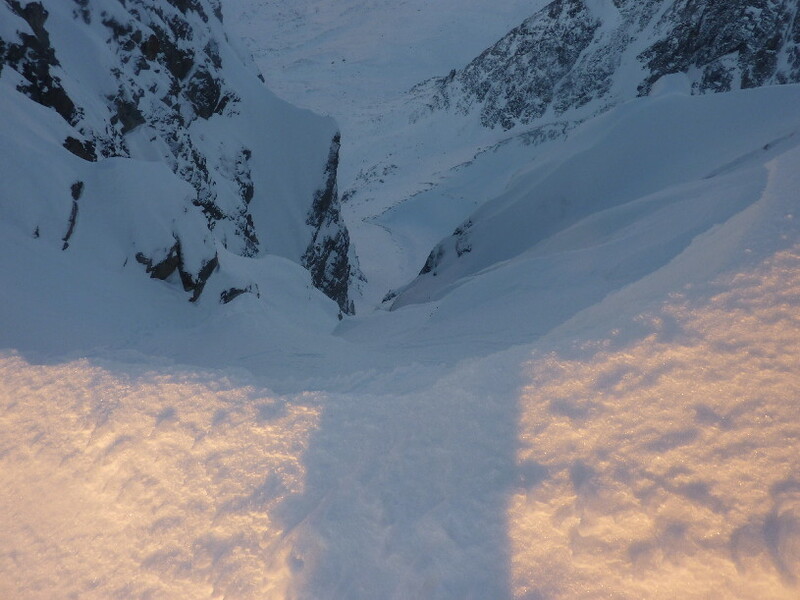 Looking down the couloir. 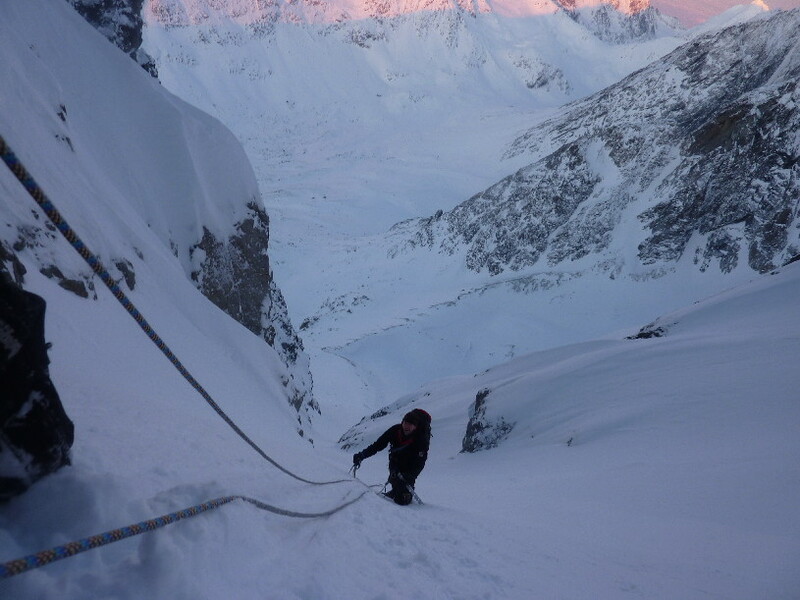 Shall we belay here? Guhkesgáisi as seen from Lakselvdalen. 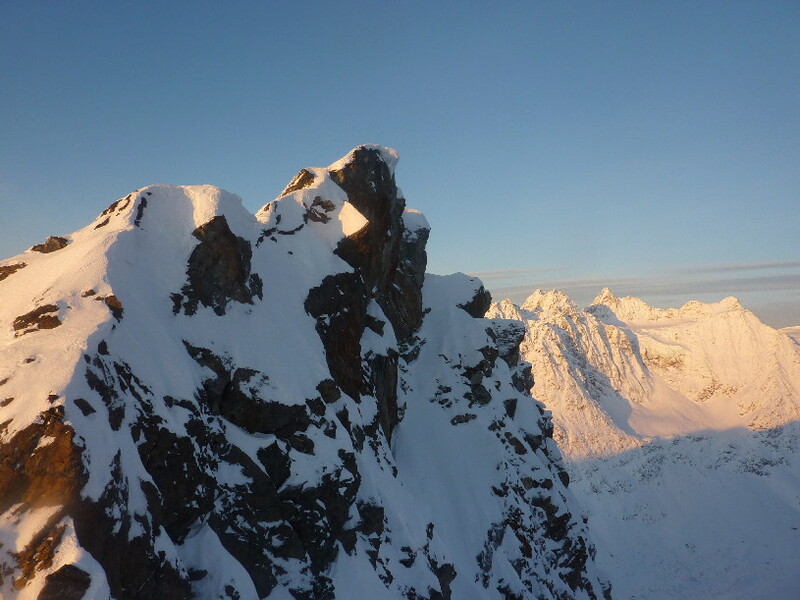 The Main summit (1580) to the left and the West summit (1302) to the right. © Geir Jenssen and Kent-Hugo Norheim.